With a lifelong love of the game of golf, Dean Reinmuth has emerged as one of the most respected golf instructors in the world today. Dean's golf career spans back more than forty years from his first job working at Naperville Country Club in Illinois. Starting out as a caddie, Dean worked his way up through the ranks by serving as a groundskeeper, working in the bag room and then making his way into the pro shop. Soon after, Dean became a 1st assistant professional at Midlothian Country Club, in Midlothian, Illinois. These various positions enabled Dean to learn all aspects of the business of golf while fine-tuning his playing skills. 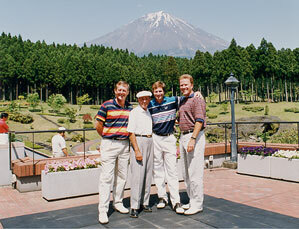 He credits these experiences with setting the groundwork for what has evolved into a very successful golf academy. After first playing golf on the high school and college levels, Dean turned professional, touring the world for eight years on the competitive circuit. Upon completion of his professional career, he focused on doing what he felt he did best by motivating and teaching others. Two of his first students were top-ranked junior players in the San Diego area. In addition, he taught the PGA Section Player of the Year from the San Diego area as well as a professional golfer who qualified for the U.S. Open twice. His success with these players led him to work with a young junior player named Phil Mickleson. Credited with developing Philís game since age 13, Dean Reinmuth worked with him through Philís high school and college ranks. Today Dean is recognized as one of the Top 50 Golf Instructors in the U.S. by Golf Magazine and continues to work with several prominent players on the PGA, LPGA, European Tour, Nationwide Tour as well as the Senior and Canadian Tours. As an instructor, Dean Reinmuth is most recognized for developing his "Swing Shaping System." This instruction approach, which he uses with the PGA Tour Players and amateur golfers alike, focuses on making slight adjustments to the golfer's own natural swing, as opposed to completely changing it. This "reshaping" approach allows golfers to hit their best shots more often while improving the quality of those occasional "miss-hits." Dean has attended corporate golf programs, sales incentive trips, group outings and charity events for companies such as Northern Trust, Isuzu, American Airlines, Maritz Travel, Inc. and Paine Webber. 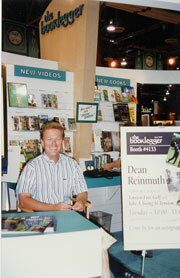 In 1981, Dean established the Dean Reinmuth School of Golf in San Diego, California. In 1997, the school was renamed the Dean Reinmuth Golf Schools, LLC. with expansion sites in the works for 2001. This internationally renowned school is dedicated to developing the talents of both average players and aspiring professionals from around the world. His latest school opened in Tucson, Arizona at The Arizona National Golf Course in 2002. Well recognized on the media circuit, Dean acts as spokesperson for his own companies and represents ElectricSpin, Players Choice Putting Greens, Wilson Golf Clubs and many others. 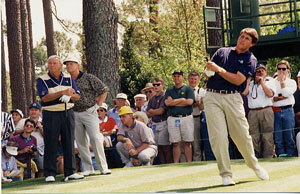 He is credited with developing and marketing the best selling instructional video, "Take a Swing at Tension," and released his first book Tension Free Golf in 1995. His media credits also include co-hosting television commentary segments for the PGA Tour where he is a regular on Golf Channel Academy Live. He has hosted his own series on Golf Channel Academy since it's inception in 1996, as well as a professional advisory staff member for Golf Digest and a regular contributor of articles for various golf trade magazines and international golf consumer magazines. As he continues to share his vast knowledge of golf with others, Dean Reinmuth shows no signs of slowing down. His peers will attest to the fact that he maintains an extremely dedicated work ethic and shares the same enthusiasm for this sport today as he did forty years ago.